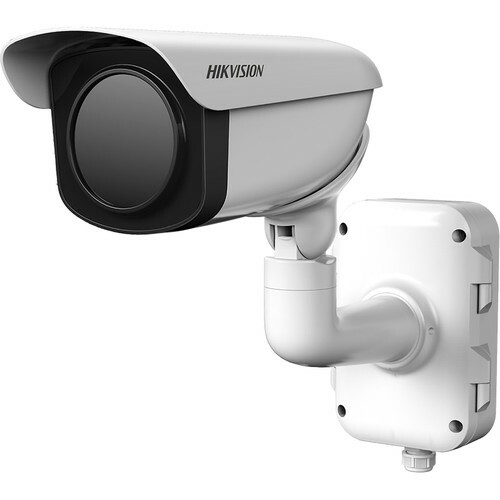 The DS-2TD2366 Outdoor Thermal Network Bullet Camera from Hikvision uses a vanadium oxide uncooled focal plane sensor and 50mm fixed lens to capture thermal video at a maximum resolution of 640 x 512. It features AGC (Automatic Gain Control), 3D-DNR (Dynamic Noise Reduction), and NETD to improve overall image quality. The thermal camera features a fire detection algorithm and a wide range of smart functions, such as alerts for temperature exceptions, line crossing, intrusion, and region entrance/exit. Enclosed in an IP66-rated housing, the camera can be used for indoor and outdoor applications. It can be powered via PoE+, simplifying installation and minimizing cable runs.